Staircase supplied in kit form. Supplied with 2 strings and 4 treads at 895mm. 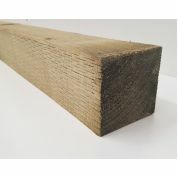 this makes the overall width approximately 959mm. 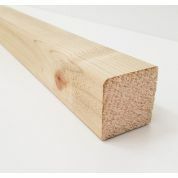 The stair strings are left as a longer length, you will need to cut the mitres/ends yourself. 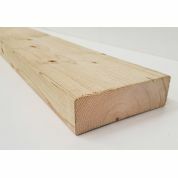 Only the timber is supplied, you will need to get your own glue and fixings. Example rise = 175mm going 195mm. We can alter the rise to your measurements so that each tread as an equal rise. Please state your rise in the notes when checking out. There are two ways to finish the top, we have provided an additional drawing to show both ways, this may effect the size you want the risers set to. With the stair strings being provided longer, you can do either way. Option A shows the floor height at 875mm with the last tread being lower then the finished floor level, where as option B shows it level. If choosing option B you may cut the depth shorter if you would wish to. A usual internal flight of stairs are normally set at 42°, for these it would make the risers at 175mm. 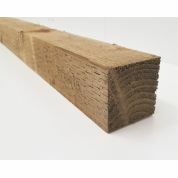 For the timbers to last longer it is recommend that you seal all ends and cut outs with an appropriate end sealer. We bespoke make this item to any size, with any number of treads and height, please email for a cost. Please note these decking steps don't comply to building regulations as an internal staircase. 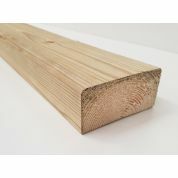 Regularised Treated Structural Graded Timber Joists 44x44mm 2x2"
Treated Timber Sawn Post Joist Pressure Fencing Decking Fence 145x44mm 6x2"
Regularised Treated Structural Graded Timber Joists 95x44mm 4x2"
Treated Timber Sawn Posts, Fencing Decking Joist 75x75mm 3x3"
Treated Timber Sawn Post Joist Pressure Fencing Decking Fence 100x100mm 4x4"